You may be familiar with Glossy Nightshade as it grows as a weed almost everywhere, especially on vacant lots and in disturbed soil. The small fruit can be eaten when black but is poisonous when still green. Also, be careful with this one as there are a lot of similar species with varying levels of toxicity. 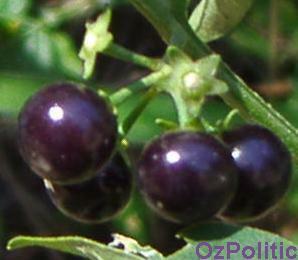 There is disagreement as to whether glossy nightshade is poisonous and it may be location dependent. Solanum americanum, the American nightshade, is a herbaceous flowering plant native to the Americas, from the south and west of the United States south to Paraguay and Peru; it also occurs in Hawaii, where it is considered possibly indigenous or may be a Polynesian introduction. It is used as a medicinal in Cameroon, Kenya, Hawaii, Panama, Sierra Leone, and Tanzania, and as a wild or cultivated pot herb in Cameroon, Ghana, Guatemala, Kenya, Madagascar, Mauritius, Hawaii and other Pacific Islands, Nigeria, Papua New Guinea, Peru, Sierra Leone, the Seychelles, South Africa, Tanzania, and Uganda. It grows up to 1-1.5 m tall and is an annual or short-lived perennial. The leaves are alternate on the branch, and vary greatly in size, up to 10 cm long and 7 cm broad, with a 4 cm petiole and a coarsely wavy or toothed margin. The flowers are about 1 cm diameter, white or occasionally light purple, with yellow stamens. The fruit is a shiny black berry 5-10 mm diameter, containing numerous small seeds; when mature they should be considered poisonous as they may contain high levels of solanine. Also, the plant is easily confused with truly poisonous nightshades. 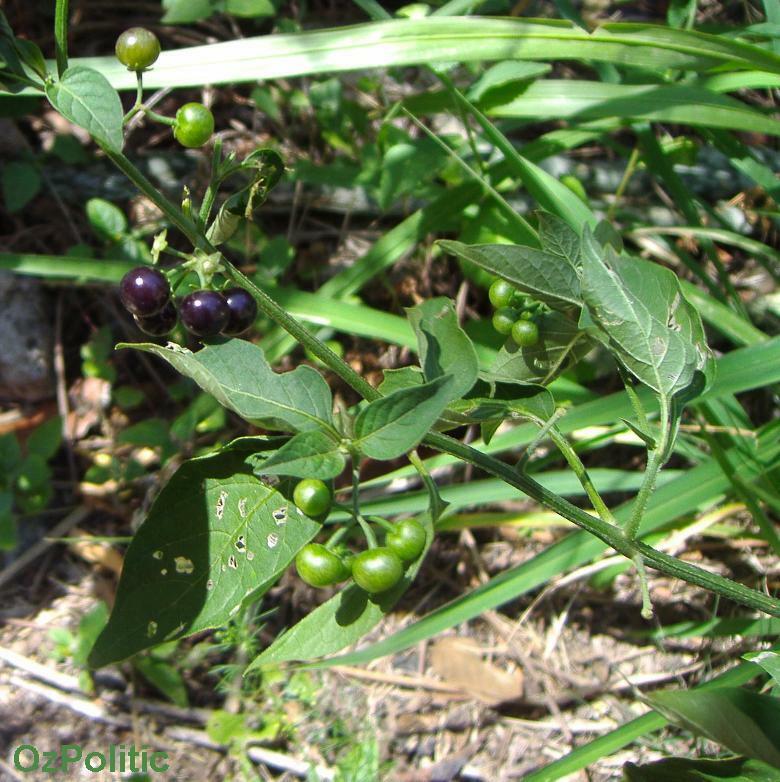 American nightshade can be confused with a variety of other related nightshades. Here is a quick guide for differentiating between species. The underside of its hairy leaves is not reddish-purple. The berries are speckled with white until it is fully ripe and turns black. Berries are purple or dark green and dull. They are almost completely exposed (very small calyx). The underside of the leaves is reddish purple and the berries are dark. Berries are light green or yellow when ripe and the leaves are so hairy that they may feel sticky.